Packing my bags - what to bring? It's vacation time, so the blog will be quiet from now until after New Years. Time to rejuvinate, play with my family (a trip to the snow!) and having some nice time curling up with a book! So what to bring? I'm working with middle school students this year, so I've been trying to do more reading of books that will hook teens. I'm almost finished with The Rock and The River, by Kekla Magoon. It's fantastic, and drew me right in. Sam is a young African American teen whose father is a leader in the Civil Rights Movement in Chicago, 1968. His older brother is becoming frustrated with police brutality in their neighborhood, and the slow pace of change. Sam is torn between these two major figures in his life - his father, with his nonviolent protests, and his brother who has just become a Black Panther. I want to read a fantasy next. I'm torn between a new fantasy, The Lost Conspiracy by Frances Hardinge, and a classic fantasy highly recommended by a student, Alanna: The First Adventure, by Tamora Pierce. The Lost Conspiracy has been highly recommended by the listserve Adbooks, which I've enjoyed following. It seems like it would appeal to our 5th graders who like fantasy and adventure mixed together. But it's very long! I think I might try to go with Alanna. I've been wanting to read Tamora Pierce's books for a long time, and it means so much to students when someone else takes their suggestions about what to read. As always, we'll have a bit of debate about what audiobooks to listen to in the car. We're finishing up Boy, by Roald Dahl. And we have Tell Me a Story, a collection of folktalkes by Amy Friedman - we've started listening to them and are really enjoying them. I'd like to try either The Lion, The Witch and The Wardrobe or Betsy-Tacy. But I rarely get to choose - usually, I'm outvoted by the kids. Thank you for all your support with my blog this year. It's been a wonderful growing experience for me. All the best, until the New Year. Do your older children enjoy audiobooks? There are some wonderful productions for older children. What sets these apart for older children is their emotional depth and captivating stories. Below I've focused on two that are particularly appealing for girls who like realistic fiction. 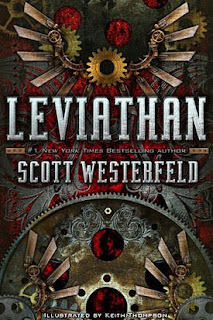 For kids who like fantasy or adventure, I'd highly, highly recommend Leviathan, Scott Westerfeld's newest book, reviewed here. Twelve-year-old Catherine loves her younger brother, David, but she's embarrassed by his autistic behavior. She knows that she has to go to extra lengths to help him, but she's also angry that her parents focus on David more than her. In an effort to make life more manageable for David, Catherine creates rules for him (It's okay to hug Mom but not the clerk at the video store). Really, she's trying to make life predictable. But what she learns through the course of this story is that life is anything but predictable. I adored the audiobook for this 2007 Newbery Honor Book. Jessica Almasy captures Catherine's voice and tween attitudes perfectly. As AudioFile writes, "Her (Catherine's) stream-of-consciousness thoughts are resonant, and listeners can effortlessly embrace her struggles. Adult voices are clearly differentiated from the preteens', allowing keen visualization of Catherine's struggle to separate herself from her parents' expectations." You can download Rules to your computer, iPod or MP3 player from Audible, and easily make CDs for yourself. You can also find Rules at your local public library. Since it's published by Recorded Books, it's difficult to buy through bookstores. Have you ever finished a book and wanted to start reading it all over again, it was so intriguing? 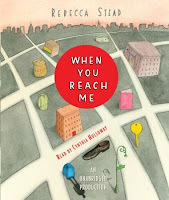 When I read Rebecca Stead's new novel, When You Reach Me, I was fascinated and gripped by the ending. I didn't see it coming, and I just wanted to start all over again. My daughter and I loved its combination of a realistic friendship story with a fantasy twist. Sixth-grader Miranda's world is turning upside down. Her best friend Sal doesn't want to talk to her, for some inexplicable reason. Now Miranda (Mira for short) must find a new best friend at school. And tiny, mysterious notes start turning up in private places, like the pocket of her winter coat that's been in the closet since last March. The notes say things like “I am coming to save your friend’s life and my own” and “You will want proof. 3 p.m. today: Colin’s knapsack.” Miranda doesn’t know who is writing these things or where they are coming from but it is absolutely clear that the person who wrote the notes knows things that no one could know. Narrator Cynthia Hollaway manages to convey Miranda's confusion with these notes in a way that makes the listener care about her discoveries and her worries about her friendships. You can download When You Reach Me from Audible, buy the CDs on Amazon, or find them at your local public library. There is much speculation that this might win the 2010 Newbery Award. - Around the World in Eighty Days, by Jules Verne, narrated by Jim Dale (same narrator as Harry Potter) "One of the best narrations on the planet. Every character is easily identifiable and the accents were perfect." Audiobooks are a wonderful way to bring children in 2nd and 3rd grade into longer, more developed stories. Children in these grades love more complicated stories, but they are still working on their reading skills. They often do not have the patience or ability to read these longer stories. Try listening to one together on a long car ride, and you'll see how much you all enjoy it! Here are three audiobooks we've really enjoyed this year with my family. Below I will include others that readers have recommended. Do you have others that you've enjoyed listening to with your children? Let me know - other parents would love the recommendations! Send me an email (greatkidbooks at gmail.com) or leave a comment below, and I'll pass the word on to other parents. Dominic is a dog in search of his fortune. He leaves his home, taking only his hat and his piccolo, and along the way he meets many animals, developing new friends as he goes. My children have been captivated by Dominic's story, as he bumbles his way along, searching for - well, he doesn't quite know what. Dominic learns about the world and himself as he makes new friends and outwits the notorious Doomsday gang. This is a wonderful story, with charm, heart and a bit of magic. One of the interesting things I found myself wondering is what made Dominic so determined to defeat the Doomsday gang. Was he getting revenge for the way they had tricked him, or was he trying to make his world a safer place for his friends? The length of this story makes is a good choice for a broad age range. While 3rd graders and older will get the most out of this rich story, young children enjoy it as well. 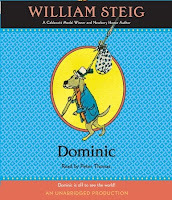 Dominic was re-released this year by Random House / Listening Library. You can find it on Audible and download it to your computer, iPod or MP3 player. You can buy the CDs on Amazon, or find them at your local public library. Twelve-year-old Percy Jackson knows he's different, but he never imagined that his life would turn into a hero's journey with fast-paced adventure and life-or-death battles with monsters. Percy is an average kid living in modern-day New York City; he has trouble concentrating and paying attention in school. But when his algebra teacher becomes a deadly monster and his scrawny best friend turns out to be a satyr, he learns he's a hero -- the half-blood son of an Olympian god. These books fly off the shelves in our library. They become a rage, typically with 4th grade boys - but many girls I've know (including my own daughter) love them. The stories are filled with twists and turns, weaving in a multitude of characters from Greek mythology. Listen to these stories before the movie comes out in February. The audiobooks are gripping, as you hear about Percy's quest to find who stole Zeus' lightning bolt. As AudioFile magazine writes, "Narrator Jesse Bernstein artfully creates a variety of characters, including nervous goat-boy Grover and bossy wise-girl Annabeth (Athena's daughter), but his masterpiece is the boyish and sarcastic Percy himself... Adults and children alike will be spellbound as they listen to this deeply imaginative tale unfold." 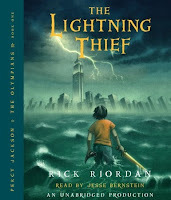 The Lightning Thief is the first of five volumes in the Percy Jackson series. You can download the audiobook to your computer, iPod or MP3 player from Audible, or buy the CDs through Amazon. They are also available at your local public library and many local bookstores. My family has enjoyed many Roald Dahl books, so I was particularly pleased when my children asked to listen to Dahl's autobiography Boy. Derek Jacobi narrates this humorous and delightful account of Roald Dahl's childhood in a friendly, amusing tone. The listener feels as if he is at his grandfather's knee listening to tales long ago. Jacobi's enchanting voice makes one feel that Dahl himself is speaking. Unfortunately, this is getting a little hard to find. You can download it at Audible to your computer, iPod or MP3 player. From there you can easily burn CDs. We found our copy at our local public library. An interesting question: I noticed that the narrator, Derek Jacobi, also narrates many of the Chronicles of Narnia. Has anyone tried this series on audiobook with their children? Michael York has also read I think we may try this in January. Please send other suggestions, and I will add them to the list! If you purchase a book through Audible or Amazon, a small commission goes toward Great Kid Books. Thank you for your support. This year I've been encouraging my kindergartner to listen to longer audiobooks. In preschool, she loved picture book kits, where you listened to a book while turning the pages. But it's a different skill to listen to a book without the pictures in front of you. Young listeners need to concentrate on the sounds more, develop the pictures in their mind, and follow the plot. For these young listeners in preschool and kindergarten, I look for chapter books that are about 1 hour in total length. Here are two of our favorites from this year. Children love to hear how the clever fox outwits the farmers as they try to they try to dig him out. When the farmers lay siege to the foxes' den, Mr. Fox tunnels to where the farmers least expect him--their own larders! In the end, Mr. Fox brings a feast to his family and a whole community of burrowing creatures. This is a great first longer chapter book for children to listen to because it has such a clear sense of characters and plot. Older children (and adults!) will also enjoy it for the fun story, more complex language and captivating narration by Dahl. 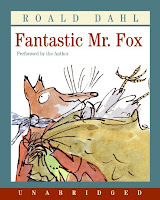 Fantastic Mr. Fox is available for download to your computer, iPod or MP3 player on Audible.com. You can purchase the CDs on Amazon. And you can find it at your local public library using WorldCat.org. Kate DiCamillo, best known for her novels for older children, has written a series of short chapter books starring Mercy Watson, a pig with attitude, good humor and a love of hot buttered toast. Mercy is a "porcine wonder", the beloved pet of Mr. and Mrs. Watson who treat Mercy as a member of their family. Children laugh at the craziness of how Mr. and Mrs. Watson adore Mercy, treating her as their own child. Narrator Ron McLarty brings the simple sentences to life with perfect tone and inflection. You'll laugh as the police officer talks to himself or the grumpy neighbor, Eugenia Lincoln, proclaims that this is no way to treat a pig. The Mercy Watson series was written as an early chapter book for children in 2nd and 3rd grade, and it works very well as a first chapter book for preschoolers and kindergartners to listen to. They love the goofy humor and the Watson family's optimism and good cheer. This audiobook won the AudioFile Earphones Award in 2006 for truly exceptional audio presentations. The Mercy Watson Collection, volume 1 is available on Audible for downloading to your computer, iPod or MP3 player. You can find the CDs on Amazon or at your local public library. I've gotten some great suggestions from readers. Here are some other audiobooks that work well with young listeners (ages 4 - 7) recommended by other parents. I've linked them to WorldCat. I'd love feedback on whether the links to WorldCat work to link you to your public library. If you make a purchase on Amazon or Audible using these links, Great Kid Books receives a small commission, which will be used to buy more books to review. Thank you for your support. Do you have a long car trip ahead this vacation? Try listening to audiobooks in the car. They make a great alternative to movies and music, and are fun to share with the family. I've had great success downloading audiobooks to my MP3 player - either for free from my library system or through Audible.com. My biggest challenge is finding books that work with a wide age range. My 11 year old loves to listen to audiobooks, but she wants more complex and longer stories than my kindergartner will tolerate. So we have to take turns. Sometimes, I plug each child into their own story using headphones. But I much prefer finding stories that cross age ranges. This week, I will highlight audiobooks that work for different ages. My basic rule of thumb is that children can listen to books about two years before they can read them. So, the Percy Jackson books are great to read in 4th and 5th grade, but 2nd and 3rd graders enjoy listening to them. Here's a quick round-up that's my plan for the week. I will add the links as the posts get published. Do you have any favorites? Please let me know in the comments or email me (greatkidbooks at gmail.com) and I'll include your suggestions in the posts! One of our holiday traditions that we love to share with our children is seeing the Nutcracker ballet each year, whether it's going to the ballet or watching it on TV. This year, we took my youngest to the San Francisco ballet for the first time and she was enthralled. When the dolls started dancing, she said, "Mommy, they're people." If you can, try to read a picture book with the story before sharing the ballet - young children will get so much more out of the ballet if they know the story beforehand. 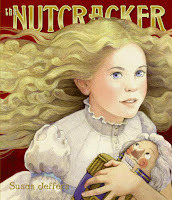 Set in the Victorian times, this version of the Nutcracker is a beautiful, simple introduction to the story and the ballet. Jeffer's illustrations bring alive a sense of wonder and enchantment. The soft hues and intricate details will draw young children into the story. She captures the excitement and emotional tenor of the story in a way that captivates audiences. The simple text clearly explains the gift of the Nutcracker at the Christmas party, the Nutcracker's fight with the Mouse King, and Marie's magical journey with the prince. With just a few lines on each page, this is a perfect introduction for young children. What I love is the combination of fantasy and reality, taking the dancers and making them into snow and lifting them into the air. In the actual ballet the music and the beauty of the dance transport the audience to dreamland. I wanted the book to have the same feeling. 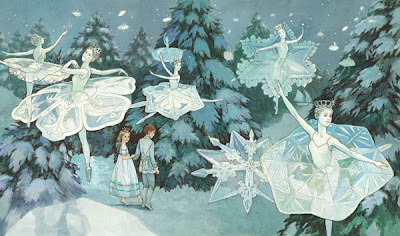 Here is a spread from The Nutcracker, when Marie and the prince begin their journey to the land of the sweets. Jeffers captures the grace and magic of the ballet, truly transporting us into this fantasy world. For a look inside, visit HarperCollin's site. The review copy came from my local public library. Find a copy at your public library using WorldCat, or stop by your local bookstore. If you purchase a book through Amazon, a small percentage will go to Great Kid Books and will be used to buy further books to review. Thank you for your support. Most of the world's surface is made up of ocean, and yet we know so little about its animals and ecosystems. Whenever students at our school study ocean animals, they are fascinated. Two new books about ocean animals really draw in a range of readers, from 2nd grade through 6th grade. The first follows scientists who explore ocean predators, and the second is a visual representation of animals living at different levels as you descend the depths of the ocean. Recently, scientists have begun to study ocean predators such as sharks, tuna and sea turtles using high-tech satellite tags to track their movements. These tags help scientists start to answer questions about where these predators breed, feed and travel. 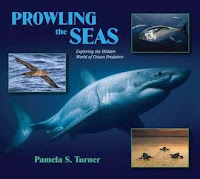 Pamela Turner (The Frog Scientist, and A Life in the Wild) follows scientists connected with the TOPP (Tagging of Pacific Predators) project, as they study four different species of ocean predators in the Pacific: loggerhead turtles, bluefin tuna, white sharks and sooty shearwaters. My children loved reading about the Great Turtle Race, following eleven turtles as they migrated from Costa Rica to the Galapagos Islands. I was fascinated to learn about the bluefin tuna, a warm-blooded fish that swims an average of 40 miles each day. The fish in the study crossed the Pacific three times, swimming from California to an area near Japan in less than 600 days! Turner draws children into the story, not just of the creatures, but of the scientists who study them. Steve Jenkins is a brilliant artist who uses his talents to help children follow their fascination with animals. 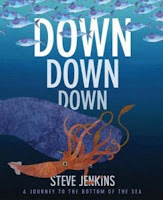 Down, Down, Down brings readers from a bird's eye view of the ocean down to the far depths of the deepest spot in the ocean, the Marianas Trench, investigating the different animals that live at various levels. Jenkins uses torn paper collages to bring over 50 animals to life. At each level, the animals swim against darkening backgrounds, sunny blue at the upper levels of the ocean, growing darker and darker as you descend. Each full double-page spread has a paragraph explaining about the environment at that level, and how the light, temperature and pressure affect the animals. A bar running down the far right of the page shows the depth as you progress down. For a look into the book, see several of the spreads at the blog 7 Impossible Things Before Breakfast. While second graders will be fascinated simply looking at the pictures and talking about the animals, Jenkins provides plenty of engrossing information both on the pages and in the end-pages for older ocean enthusiasts. Throughout both of these books is the message that we have much to explore and understand in the ocean. As Jenkins writes, "Oceans cover more than two-thirds of the globe’s surface, and well over half the planet lies beneath water more than a mile…deep. We have explored only a fraction of the oceans. In fact, more humans have walked on the moon than have visited the deepest spot in the sea." Full disclosure: I am in a book club with Pam Turner and have thoroughly enjoyed her other books. She spoke at our school's recent book fair, and all of our copies of Prowling the Seas sold out in the first few days! The review copy Prowling the Seas was kindly sent by the publisher. The review copy of Down, Down, Down came from my local public library. Find copies of both at a public library near you using WorldCat: Prowling the Seas and Down, Down, Down. If you purchase them on Amazon using these links, Great Kid Books will receive a small commission, which will be used to buy more books to review. Nonfiction Monday is being hosted today by In Need of Chocolate. Stop by to see some other great recommendations! A first kiss: it can change lives for better, but it can also lead to far more than you expect. In Lips Touch: Three Times, three stories explore the consequences of a first kiss, and the dark longing that can sometimes result. Teens will be drawn to this collection by its cover and will love its combination of fantasy, romance and horror. But best of all, Taylor's writing is lush, descriptive and beautifully crafted. Lips Touch is a collection of short stories, each of which intertwines elements of folklore, Hinduism, Zoroastrianism and fantasy. While each story is about the power of yearning and lust, each story is completely different. In “Goblin Fruit”, Kizzy yearns for love, even though she knows the tricks that goblins will use to steal girls’ souls. When a magnetic new student in her high school pays her attention, will she have the strength to resist him? There is a certain kind of girl the goblins crave. You could walk across a high school campus and point them out: not her, not her, her. The pert, lovely ones with the butterfly tatoos in secret places, sitting on their boyfriends' laps? No, not them. The ones watching the lovely ones sitting on their boyfriends' laps? Yes. The goblins want girls who dream so hard about being pretty their yearning leaves a palpable trail, a scent goblins can follow like sharks on a soft bloom of blood. The girls with hungry eyes who pray each night to wake up someone as else. Urgent, unkissed, wishful girls. Wow. From this beginning, I was hooked. Taylor's writing develops in a richly layered, fascinating way with vivid imagery and intricate worlds. In “Spicy Little Curses Such as These”, Anamique, a young woman who has been silenced forever by a demon's spell cast upon her at birth, falls in love with an emotionally scarred English soldier in post-World War I India. Her love might unleash the terrible consequences of her curse, if she chooses to believe it. In “Hatchling”, Esme wakes up on her 14th birthday seeing memories that clearly are not her memories. Whose can they be? This longest and most complicated of the three stories develops a fantasy world of immortals whose leader steals human babies to raise as her special pets. Each story in this collection is preceded by a series of illustrations that entice the reader with a background to the story, a glimpse into the story that comes before the short story. Artist, Jim DiBartolo, said in an interview at the wonderful blog 7 Impossible Things Before Breakfast, "Our hope was that the reader would be able to get a vague idea about what was happening to that character, but still be somewhat in the dark. Then, when the text of Laini’s stories began, the reader would have these lingering questions about what they had just seen. So as you read each story, the tale told in the prelude artwork would click into place as her story unfolded. It was potentially a risky concept, but we’ve gotten a lot of feedback via e-mail and at signings where people “got it” so to speak and we’re just thrilled!" The illustrations are fascinating and intriguing. I found myself lingering over them, wondering about what story they told, and then going back to them while I read the stories with many "ah-ah" moments. Teens will be drawn by the vivid cover, and will respond to the blend of sensuality, mythology and magic. My concern is that girls in middle school will be drawn by the cover, but will be confused by the complex story-telling and the background knowledge needed, especially the British colonial setting in India, the Hindu concepts of hell, and the nonlinear narrative structure. However, middle school readers will be able to connect to some of the universal themes, particularly in the first story where Kizzy longs to be pretty and this yearning attracts the goblin's attention. Below is a limited preview of the book using Google Books. Scroll through the first pages to see the artwork for the first story, "Goblin Fruit". I highly recommend this collection. Even if middle school students don't understand all of the layers of the stories, Taylor's writing is beautiful. This will be a work that teens will go back to years later, gleaning more from each story as they reread it. 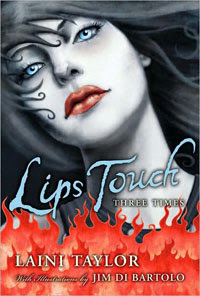 Lips Touch was a finalist for the 2009 National Book Award, for Young People's Literature. The citation said, "Lips Touch pulses with vivid imagery yet remains economical in its world-building, its unpredictable plot-spinning, and its compassionate characterization." It was also listed as one of the top five Young Adult books for 2009 by National Public Radio. For a wonderful review, see Jen Robinson's Book Page. Find Lips Touch at your local public library using WorldCat, or at a bookstore near you. If you purchase it through Amazon using these links, a small commission will go to Great Kid Books. Happy birthday to my little bear. In honor of my oldest daughter's birthday, I would like to take a quick look at a new early chapter book, A Birthday for Bear. In the classic tradition of Frog and Toad, Bear and Mouse are two friends who are opposites in many ways. In the first Bear and Mouse story, A Visitor for Bear, Bear is sure that he does not want a visitor. But Mouse perseveres and convinces Bear that he does want a visitor, and even more, a friend. Now it is Bear's birthday, and what's a friend to do? Bear doesn't like parties or balloons; Bear HATES birthdays. But all Mouse wants to do is help his friend celebrate his birthday. First, Mouse shows up waving a party invitation, but Bear can tell that Mouse wrote the card. Then Mouse comes as a balloon deliveryman, but Bear throws him out again. In a similar rendition that we saw in A Visitor for Bear, Mouse keeps finding ways to get back into Bear’s house and Bear keeps finding ways to kick him out. But then you realize that no one had ever given Bear a birthday present before. In the end, Bear accepts Mouse's friendship and gift, in a warm resolution.. This picture book is set up as an early reader. It works perfectly as a read-aloud, introducing young children (late preschool or kindergarten) to short chapter books, but I would hesitate recommending it to a 1st or 2nd grader reading trying to read independently. Young children are obsessed with birthdays, laugh at Bear's grumpy manners, and are satisfied with the resolution. But the vocabulary would be a challenge for most new readers; some examples are: innocently, shameful trickery, announced, and appalling behavior. While this vocabulary did not interrupt young listeners' comprehension of the story, it would interrupt a new reader's ability to decode or understand the words fluently. A Birthday for Bear is nominated for a Cybils Award in the Short Chapter Book category. My kindergartner definitely enjoyed listening to it as a short chapter book. Has anyone else read it with children? 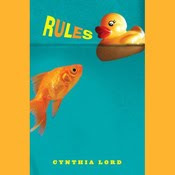 Cybils awards recognize both quality of literature and appeal to children. Find A Birthday for Bear at your local public library on WorldCat or a bookstore near you. The review copy came from Amazon. If you purchase it through Amazon on the link below, a small commission will go to Great Kid Books, which will be used to buy more books to review. We have a lot of fun with books, but occasionally we come across a book that just does not work for our kids. I think it's interesting to look at why a book doesn't work. I would love feedback from readers - do negative reviews help you think more clearly about books you read with your children? I was excited to read The Jungle Grapevine. A bookstore owner I respect enjoyed it. The cover is lively and appealing. But my kindergartner just didn't react to it. When a child says that a book is boring, often that means that they didn't understand it. It's interesting to me to look more closely at why this book didn't work. The story starts with Turtle and Bird out walking, when Turtle casually remarks, “The Watering Hole is always good for a laugh.... But lately the humor has been drying up.” Bird is not quite sure what Turtle means by this and tells Elephant that the watering hole itself is drying up. Bird's confusion sets off a chain-reaction of miscommunication, with the Elephant telling the snake, and the snake telling the crocodile. But the problem with this story is that most young children will not understand the abstract metaphor that sets off the animals' gossip and rumor. In part, kindergartners and first graders don't know what "humor" is; in part, they can't imagine the abstract notion that laughter dries up. If they cannot understand this first mistake, the rest of the book falls flat. The pen and ink illustrations are lively and imaginative, but the story presents confusion to children. While the illustrations are aimed at a young audience, the vocabulary ("humor") is beyond this group. Other people have enjoyed Jungle Grapevine. For a positive review, check Bonggamom. It has gotten mixed reviews in the library review journals. 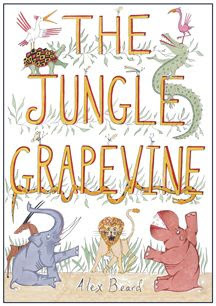 Find Jungle Grapevine at a public library near you on WorldCat. Please let me know if you like a more critical review such as this. Amazon Associate. Links to Amazon will result in a small commission for Great Kid Books. As we approach celebrating Hanukkah, I wanted to share two special books that focus on celebrating Hanukkah around the world. Holidays celebrate our traditions within our own family, and also help us feel connected to the broader world as we see how our traditions can have common threads across many places and cultures. Both of these books help us look at how Hanukkah is a part of people's lives in different places. Heiligman has written an excellent series for National Geographic, exploring how many different holidays are celebrated around the world. In this volume, she begins with a simple, clear retelling of the Hanukkah story. 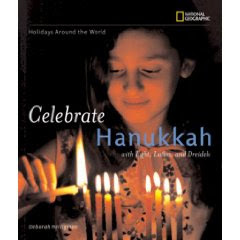 But most of the book explores how Hanukkah is celebrated around the world, in places as such as Poland, South Korea, Uganda and Peru. The full-page photographs depict children and adults lighting candles, reciting prayer, and playing dreidels. I especially like how Heiligman uses "we" throughout - it provides the feeling of community and commonality. For example, next to a picture of a young boy in Uganda, Heiligman writes: "It is important to tell everyone about the miracle. We want to show everyone we are proud to be Jewish. We are glad that we are free to practice our religion." The text and photographs help us see that Jewish people around the world, living in many different countries, all celebrate the holiday in much the same way. 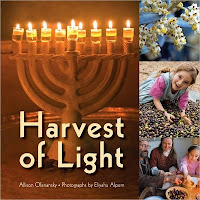 Harvest of Light is a delightful book to read at this time of year, as it puts Hanukkah in context as a celebration of the end of the harvest season. Beginning in springtime, a young Israeli girl tells the story of how her family grows and harvests olives, and then turns them into olive oil. The family works together throughout the harvest, first picking green olives for preserving. "As Hanukkah approaches, the olives start to turn black and shiny with oil." These olives are then harvested and brought to a local press to extract the oil. The story culminates with Hanukkah celebration. As her Abba (father) pours their oil into the menorah, "he reminds me it is the same kind of oil that was used to light the Temple menorah in Jerusalem long ago." The photographs bring readers right to this young girl's life. This simple story radiates with warmth and family togetherness, creating a new perspective on Hanukkah. Harvest of Light was listed as a Notable Book by the 2009 Sydney Taylor Book Award for Jewish children's literature. You can see a preview of much of the book on Google Books. For more reviews of nonfiction books, check out the Nonfiction Monday roundup at Rasco from RIF! The review copy came from my local public library. You can find these at your local library by searching WorldCat for Celebrate Hanukkah or Harvest of Light. If you make a purchase by clicking through to Amazon, Great Kid Books receives a small percentage, which will be used to buy more books to review. Gift ideas for 1 and 2 year olds - share the love of reading! "Hello, baby! Who are you?" begins this book, with a picture of a baby's hand and a monkey's tail, enticing you to turn the page. “Are you a monkey with clever toes? / Perhaps you’re a porcupine, twitching its nose.” We see an eagle, a gecko, a lion and more - all done in Steve Jenkin's vibrant paper collages. Parents will enjoy reading the rhyming questions and responses, and the bold pictures will fascinate young toddlers. 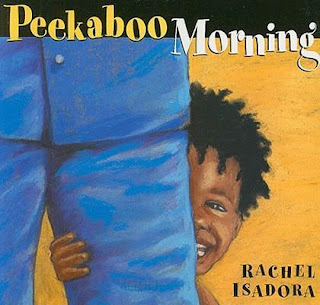 This book is so much fun to read with toddlers - they'll start playing peekaboo as you're reading the book! Help your children guess who's coming in the next page by looking at the clues in the pictures. The beautiful illustrations of a cheerful African American toddler will make you smile, and their rich, pastel colors engage children and draw their attention. 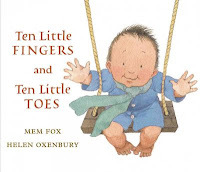 “There was one little baby who was born far away, and another who was born on the very next day, And both of these babies—as everyone knows— had ten little fingers and ten little toes.” So begins this charming book about how babies from all over are all alike in our most basic ways. Fox writes with a beautiful sense of rhythm and rhyme, but best of all, her books come from the heart. This is a special book to share with your child, and it will lead to warm hugs, tickles and kisses. 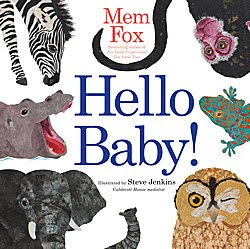 Hear Mem Fox singing this book on YouTube - what fun. I love sharing Eric Carle's board books with young children, especially The Very Busy Spider. When my first child was a toddler, we used to just look at this book and play games with all of the animal sounds. This book has a wonderful pattern to it, and my daughter loved tracing the raised line of the spider web. I was delighted when I saw the flashcards with Eric Carle's animals. One and two year olds will love looking at these sturdy flash cards, naming the animals and playing with the animal sounds. As your children get older, you can play ABC games with the cards. The review copy came from my local public library. You can find these at your local library by searching WorldCat. If you make a purchase by clicking through to Amazon, Great Kid Books receives a small percentage, which will be used to buy more books to review. Graphic novels are incredibly popular with students at our library. They love the visual dynamics and exciting or funny stories. I love how graphic novels entice them to read a book, thinking about a story arch from beginning to end. 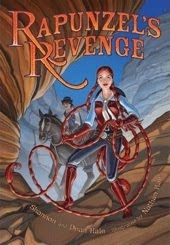 One of the most popular books this year has been Rapunzel's Revenge, by Shannon Hale. We are very excited that the sequel is being published next month. I just noticed this is on sale for a bargain price at Amazon - it's on my gift-giving list for the holidays! Rapunzel's story is familiar, but completely unique in this telling. This story takes place in the Wild Wild West, complete with lassos, six-shooters and gold mining. Action and adventure come first, with a bit of romance as the story develops. Rapunzel lives a lonely life, having been taken by a miserly rich old woman because her father stole the Rapunzel (lettuce) from the woman's walled garden. Rapunzel barely remembers her family, but she is truly unhappy being raised in her "mother's" walled estate. After scaling the walls and seeing the outside world, she realizes how Mother Gothel's power and greed have wrought harm and destruction. Rapunzel is locked in a tower far in the forest because of this discovery. But then after escaping from her tower, she meets a new friend Jack, and proceeds to try to get revenge and rescue her true birth-mother. Along the way, she discovers and proves her strength. Thinking about it, I really like the way she wants to demolish Mother Gothel not just because she's hurt Rapunzel, but also because Gothel has hurt so many other people. This Rapunzel is certainly a TAKE CHARGE kind of gal. The sequel, Calamity Jack, will be released in January 2010. It follows Jack's story as he tries to outswindle evil giants (think beanstalks), and help restores his city. Find Rapunzel's Revenge at your local public library on WorldCat.org. Or snap it up on Amazon while the bargain price sale lasts! If you make a purchase by clicking a link below, Great Kid Books receives a small commission which will be used to buy more books to review for kids! The year is 1914, and Europe is about to turn upside down, torn apart by war. This is the setting for Scott Westerfeld's new novel, Leviathan, but it's not quite the 1914 that we know and expect. In this science-fiction alternate history, the world powers are divided into "Clankers" who use enormous walking war-machines, and "Darwinists" who have developed hybrid "beasties" to use as airships, steam-trains, war-ships, and more. Filled with battles, political intrigue, science and history, this book is sure to grab kids who like gripping, compelling stories with plenty of action. Prince Aleksander is suddenly woken up and secretly taken to a Stormwalker. His parents, the Archduke Franz Ferdinand and Princess Sophie, have been assassinated, and now, the would-be heir to the Austro-Hungarian throne, is on the run. His grandfather won't recognize his rightful inheritance. All he has is a battletorn war machine and a loyal crew of men. And the people who murdered his parents will surely come after him. Deryn Sharp is a Scottish girl, a commoner pretending to be a boy in order to enlist in the British Air Service. She’s a brilliant airman. Deryn becomes a midshipsman on the Leviathan, a floating hydrogen-breathing airbeast made up of whales, bats, bees, and all manner of animals. Will she be able to fly the way she has always dreamed? Or will her secret be discovered? The audio version of Leviathan is fantastic, utterly brilliant. Alan Cummings develops several great accents which help develop the different characters even more fully than they are developed in print. The only problem I had is I kept wanting to shout, "Barking Spiders!" You miss the wonderful illustrations, but I have to admit that I loved creating my own pictures in my mind. Scott Westerfeld is the acclaimed author of the Uglies series, which is very popular in our library. I predict that this will fly off our shelves as soon as we get it processed! All of the copies are currently checked out at my local public library, but it's worth putting a hold on it. This would make a great book for kids who love action, imaginary worlds, politics or history, and books with twists and turns. The video book trailer below will give you a good idea of the political intrigue and alternate world in Leviathan. Boing-Boing: "Westerfeld writes gripping, relentless coming-of-age novels that are equally enjoyable by boys and girls, adults and kids, and Leviathan is no exception." Abby the Librarian: "Besides having a super-interesting premise, I was drawn into stories about two characters that I immediately liked. Short chapters that switch between Alek's and Deryn's points of view kept the action moving." The review copy was purchased through Amazon and Audible.com. You may find a copy at your local library on WorldCat.org. Or you can find it at your local bookstore or online at Amazon.